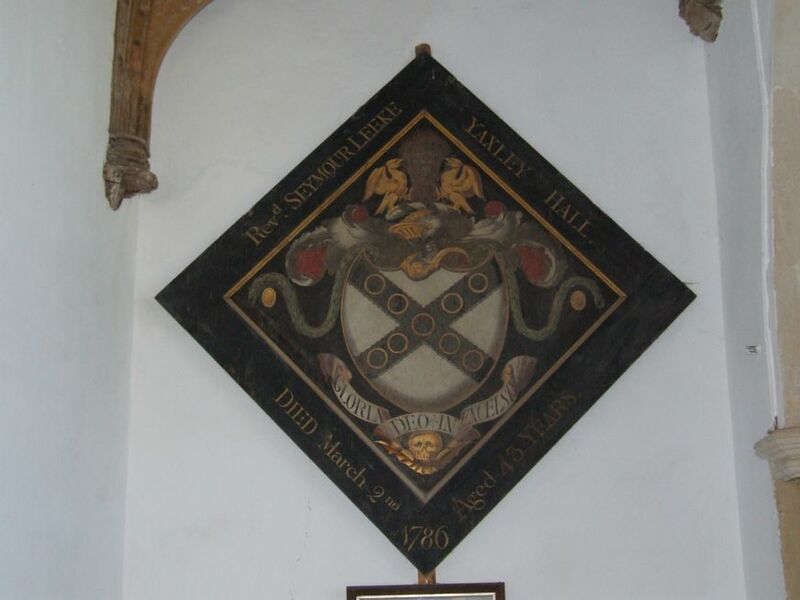 Yaxley sits out on the edge of Suffolk, a fairly large village on the outskirts of Eye, but separated from it by the main Ipswich to Norwich road, which bypasses the village. Coming to Yaxley as a visitor, you might not realise what this village was like before the bypass. 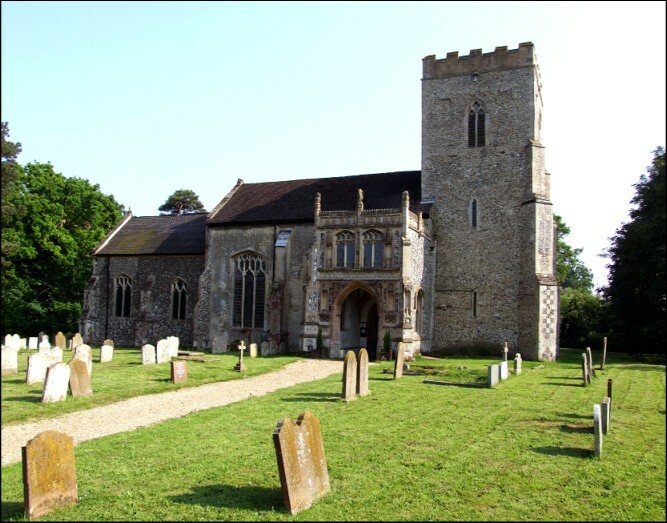 The traffic that thunders out of Norfolk half a mile east of the village once went right past this church, braking sharply to avoid the dogleg bend. It must have been pretty awful. Now, the small graveyard is a peaceful spot, perhaps still recovering from the shock. There's a super Arts and Crafts house opposite the churchyard gate. 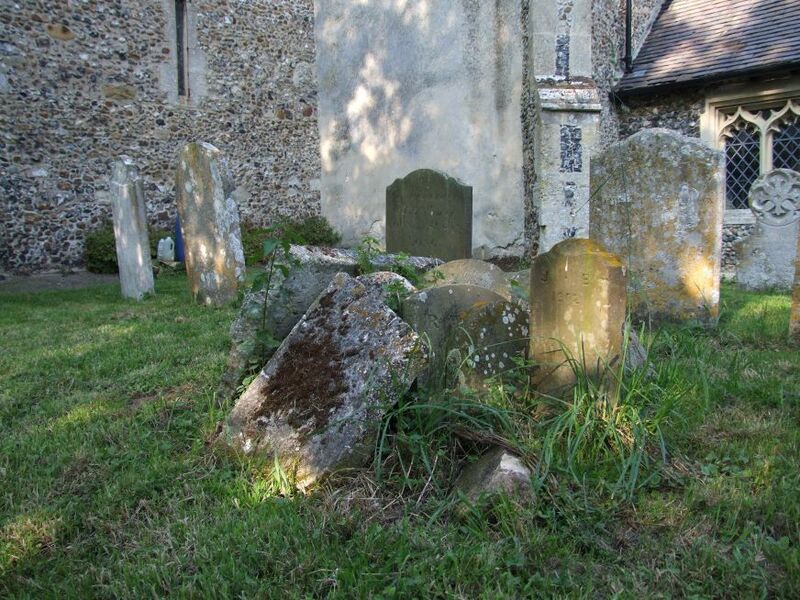 There are some nice 18th and early 19th century stones. 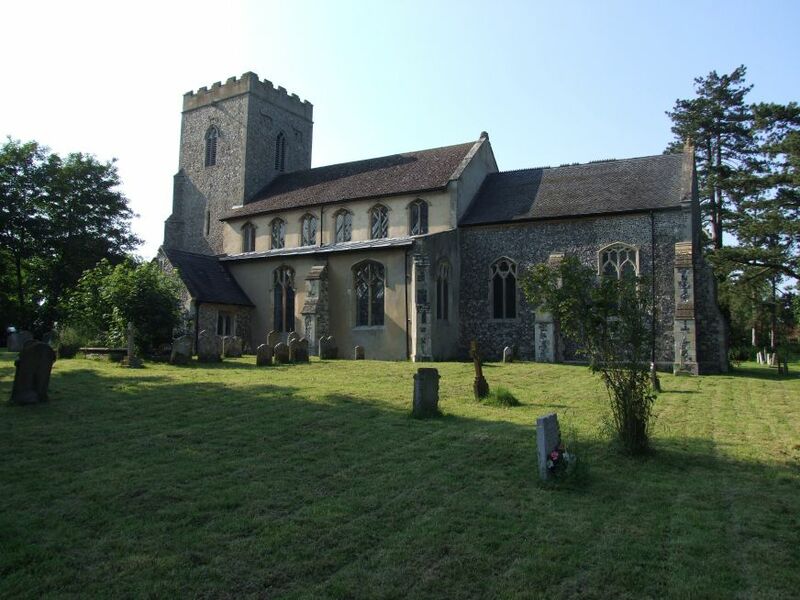 In 1988, the dancer and choreographer Frederick Ashton was buried here. Not far from St Mary, up the village street to the north, there's something rather odd. In the middle of the village is a huge, urban bridge that once carried the A140 over the railway line between Eye and Mellis. Indeed, there was a railway station here in Yaxley. Now, both the traffic and the line are gone. Climb the bridge now, and you'll find that the railway track was taken up years ago. Perhaps, one day, archeologists may wonder at such a large structure in such a little place to no apparent purpose. 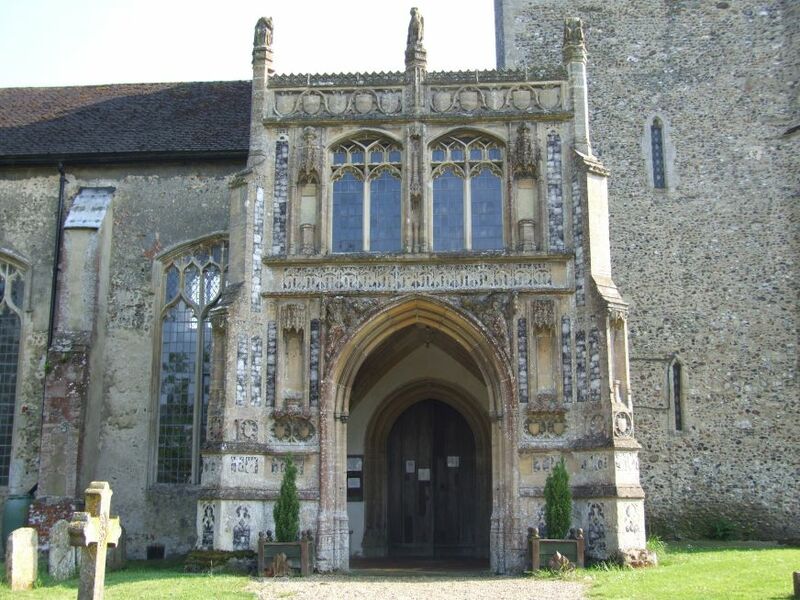 Back in the days when this was a busy place, the north porch of the church probably distracted a few drivers. It must be one of the most attractive late medieval porches in East Anglia - not grand like Mendlesham, or magnificent like Woolpit or Eye, but stately and attractive, with its two large windows on the upper storey. Marian monograms make a line above the spandrels, from one of which a lichenous woodwose creeps silently across, grinning sardonically. 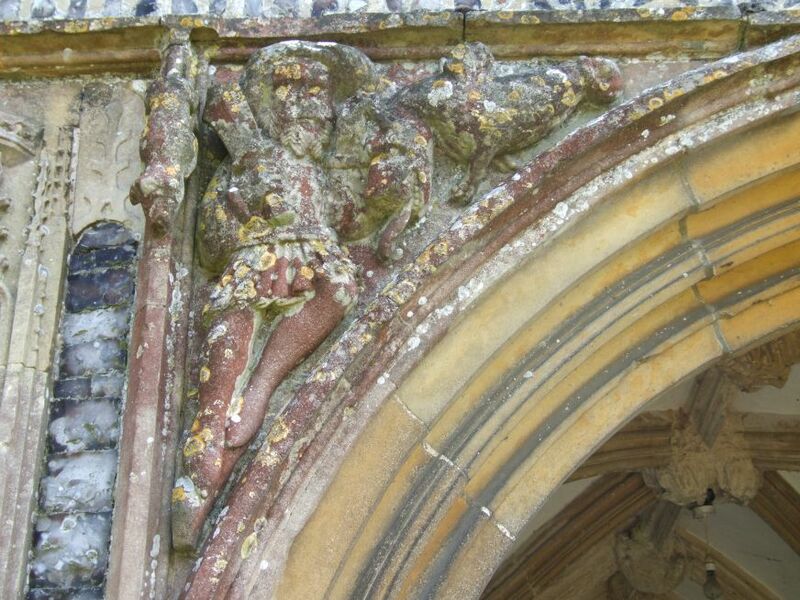 His partner across the way is a rather more serious giant, again characterful with lichen and colour. 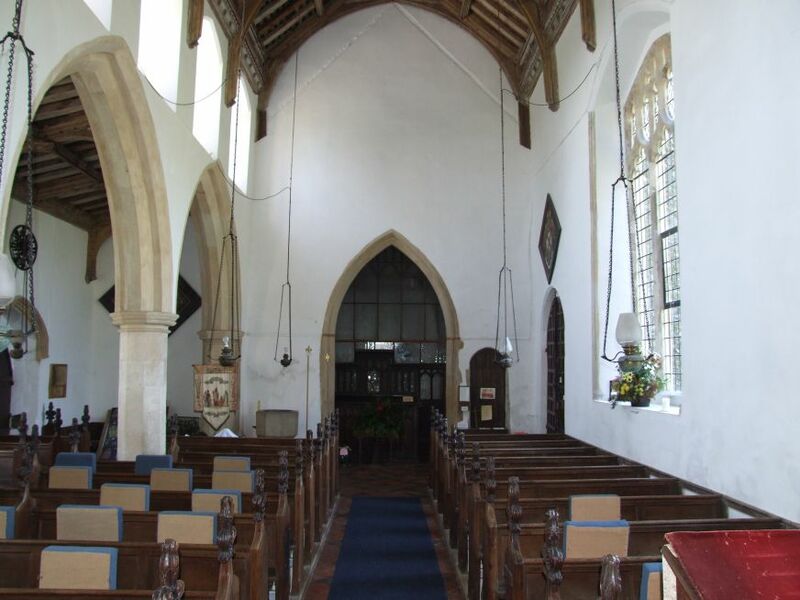 The porch rises to the full height of the nave, itself raised in the 15th century. 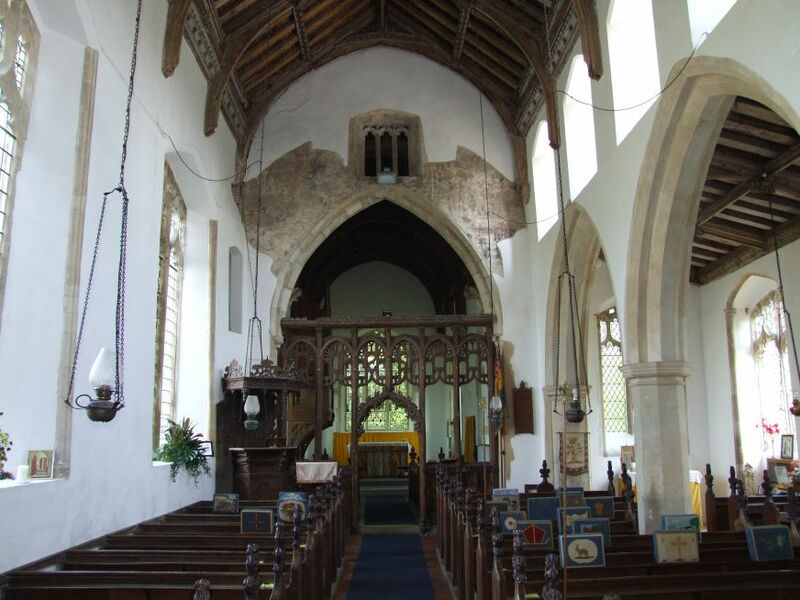 The lack of a clerestory on the north side, and the shortness of the nave, creates a fortress feeling. This is ameliorated on the south side by an aisle and a pretty clerestory. The 14th century tower climbs above all this; pleased, I'm sure, to no longer be a familiar landmark. Stepping into the porch, the first sign of the character of the interior comes from the glass in the windows; apparently medieval quarry tiles, with an inscription asking for prayers for a donor, they are in fact a product of the late 19th century Anglo-catholic movement, of which Yaxley was an enthusiastic member. Genuinely medieval are the bosses in the vaulting above. 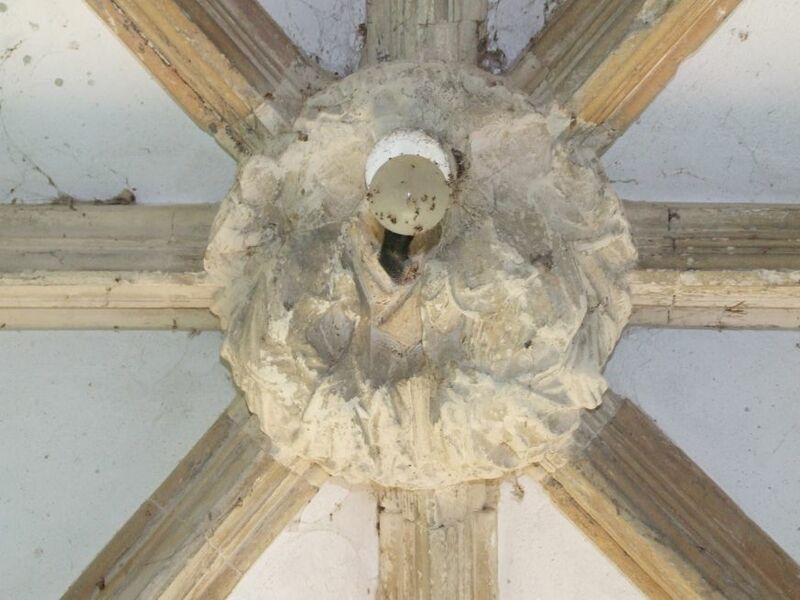 Incredibly, the central one of Christ in Majesty has had an electric light fitting punched through it. 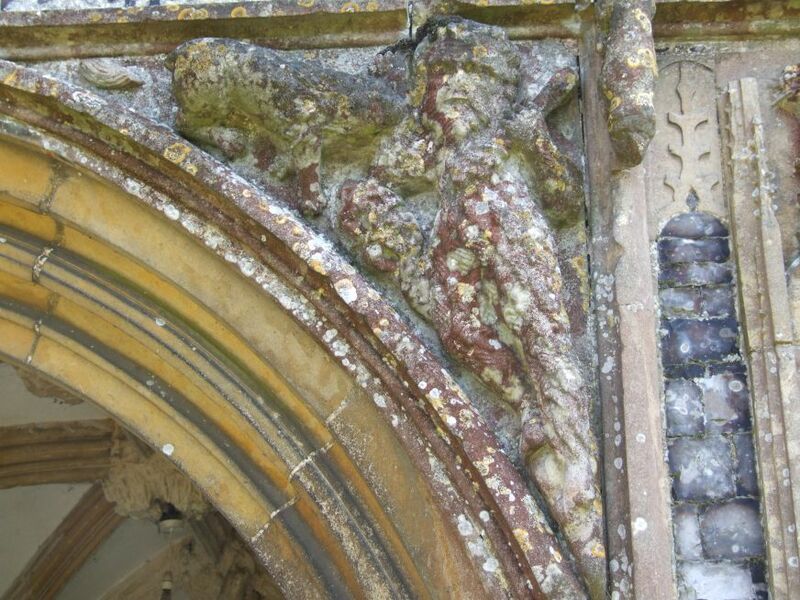 Stepping into the church, there's an intriguing survival hanging above the south doorway opposite, It is the Sexton's wheel. 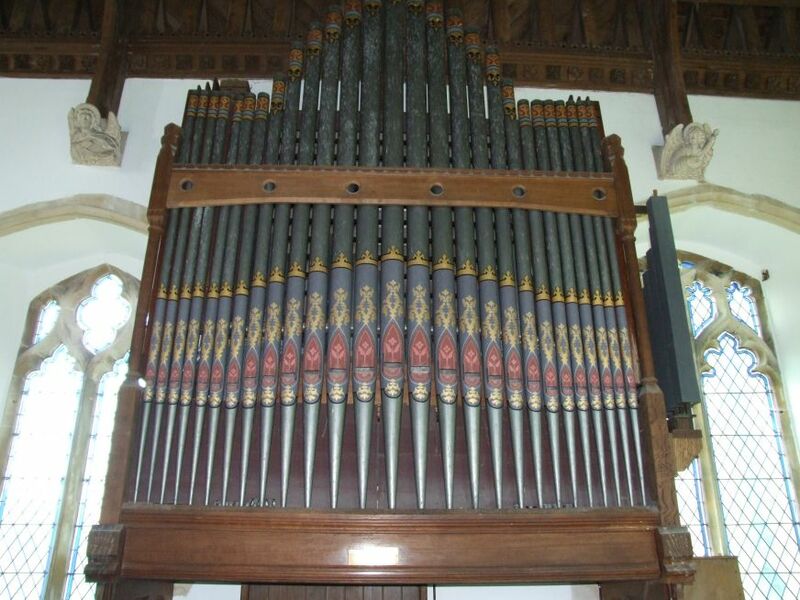 It is one of two survivors in East Anglia, the other being a few miles away at Long Stratton in Norfolk. It seems to have been a means of calculating which of the six feast days that honoured the Blessed Virgin Mary would begin a year long fast for a penitent. Six threads hang from the wheel, and when it was spun, the one that hung downwards was the chosen feast. 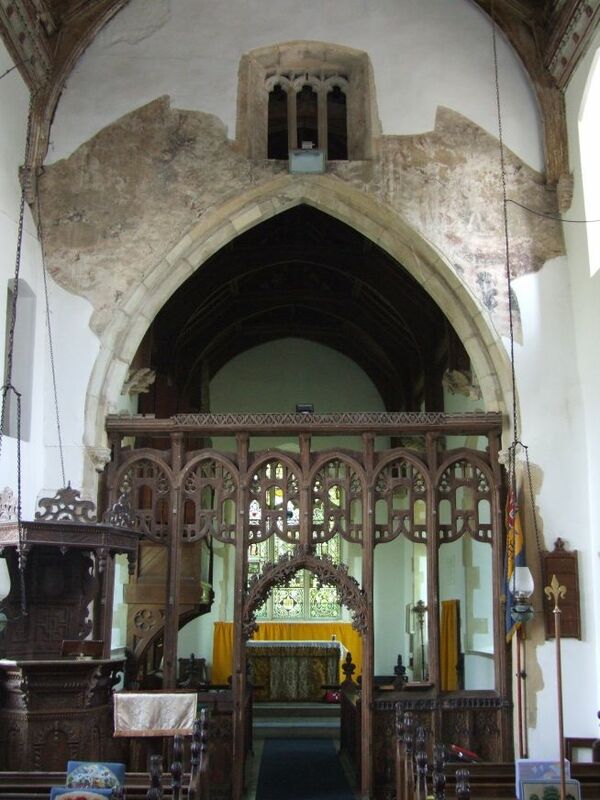 Despite the aisle, there is a feeling of great height in the nave, accentuated by how short it is, and, perhaps, by the way the late 15th century roodscreen fills the chancel arch. 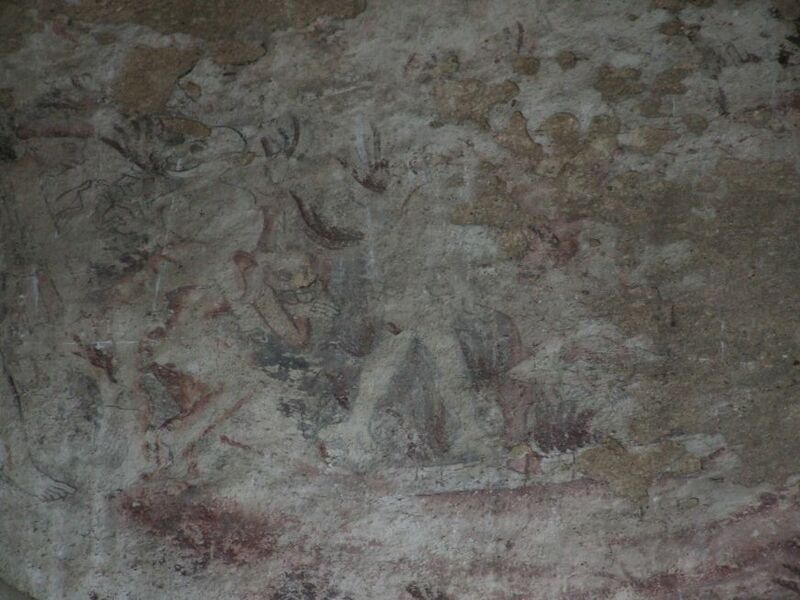 Above the arch, the wall is vast, with the remains of a doom painting and a three light window, of which more in a moment. 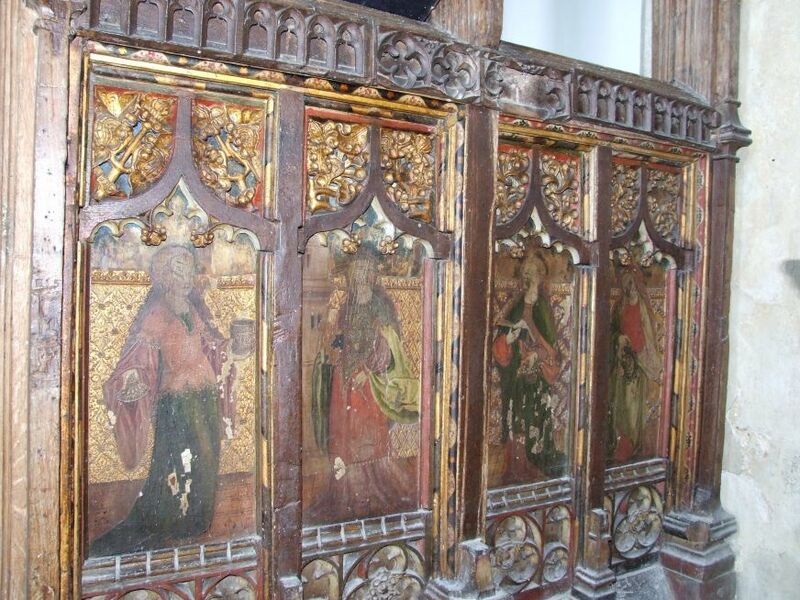 The faces of the Saints in the dado were viciously attacked by Anglican reformers in the 1540s, but enough imagery survives to identify Saints Ursula, Mary of Magdala, Catherine, Barbara, Dorothy and Cecilia. St Barbara's tower stands life size in the distance behind her. 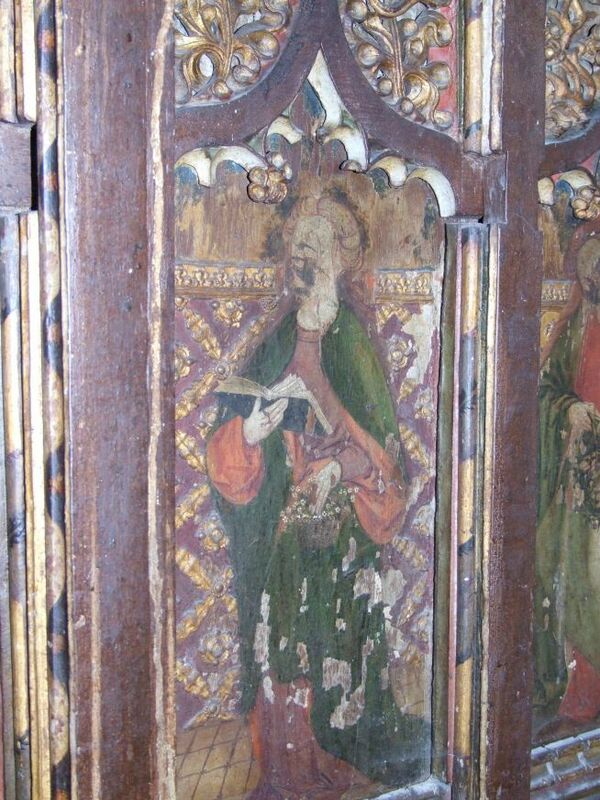 The flowers carried by St Dorothy and St Cecilia are exquisite, carvings that are at once abstract and yet echo foliage and formal shapes. In the spandrels of the dado are delicate carvingsThe upper screen has the most beautiful tracery, seen at its best from a distance as it bubbles up into the arch. Looking up from the screen, there is a most interesting triple light window in the east nave wall. 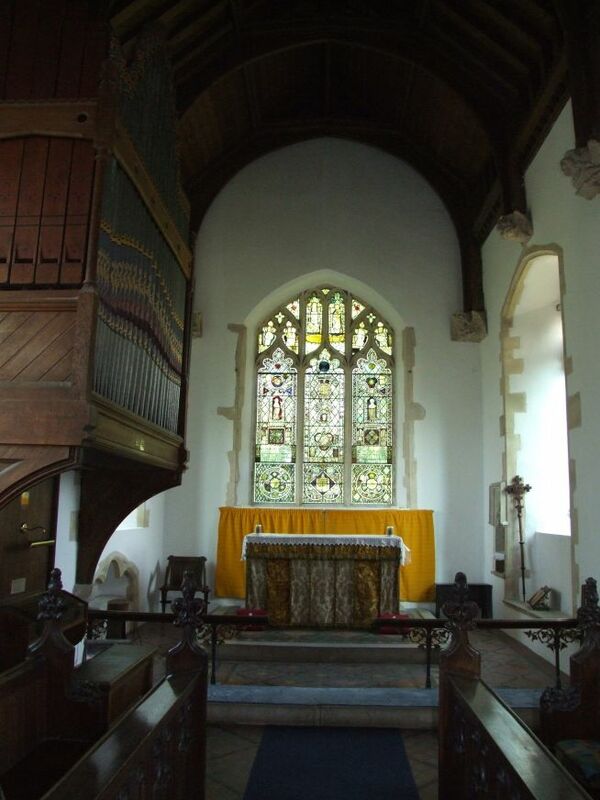 Now, we need to remember that the chancel here was rebuilt in the 1860s, and the chancel arch remodelled at that time. 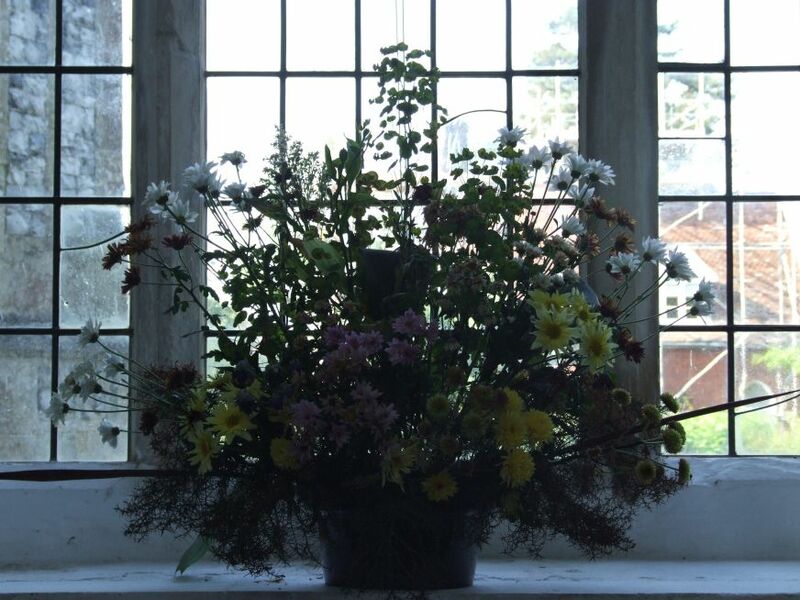 But the window was clearly intended as a backlight for the rood - it would have been most dramatic, especially in the morning. However, it presents a fascinating problem. 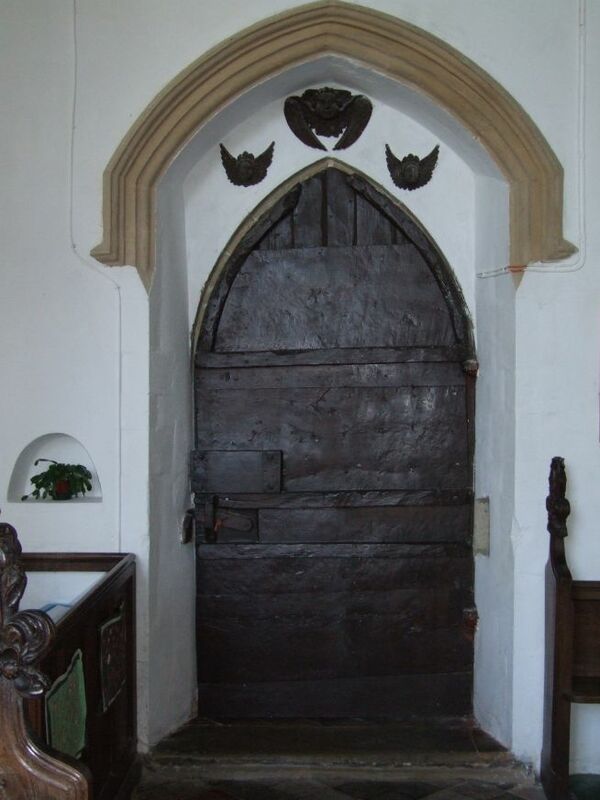 The upper rood loft doorway survives in the north wall, and is roughly level with the top of the screen. 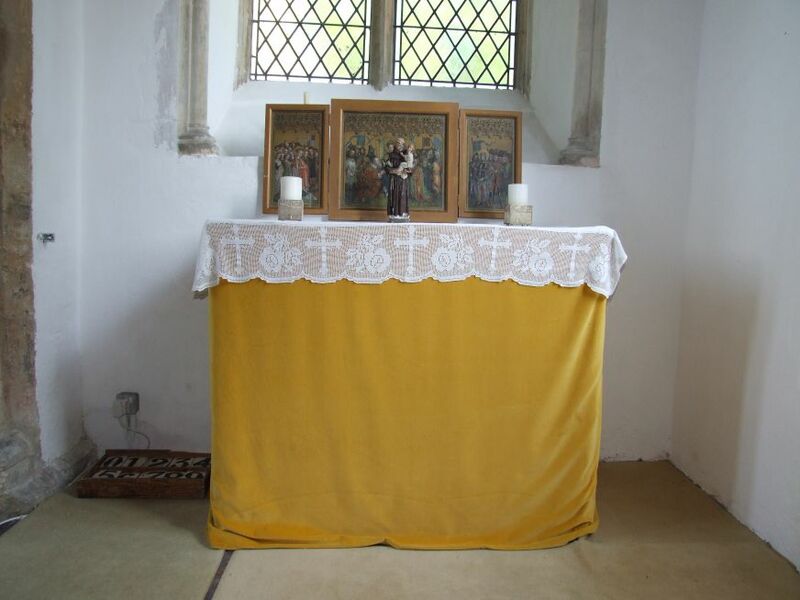 Furthermore, the location of the rood beam, on which the candles burned, can be located by the surviving stumps in the wall just above the screen. Parts of a doom painting survive, much higher than the beam, and the triple light window is higher still. So this must have been a massive rood, stretching 15 feet or more, if we assume that the window is placed at the point of highest drama. In which case, why a triple light, since the proportions of the rood would have placed Mary and John far beyond the window? 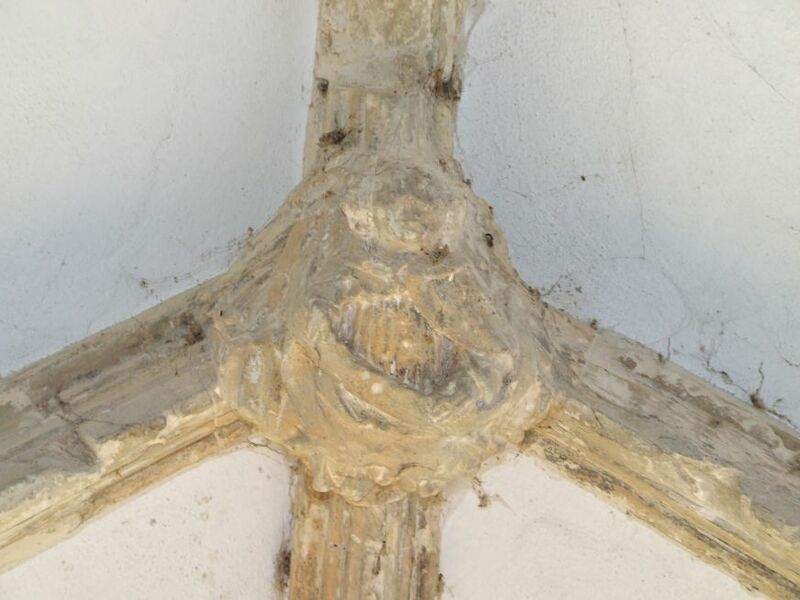 Or was the rood actually supported by the strange corbel in front of the window, and not attached to the rood beam at all? I love details of old glass, and the east window of the chancel has a vast assemblage of it, put in place here from a collection in the 1880s. 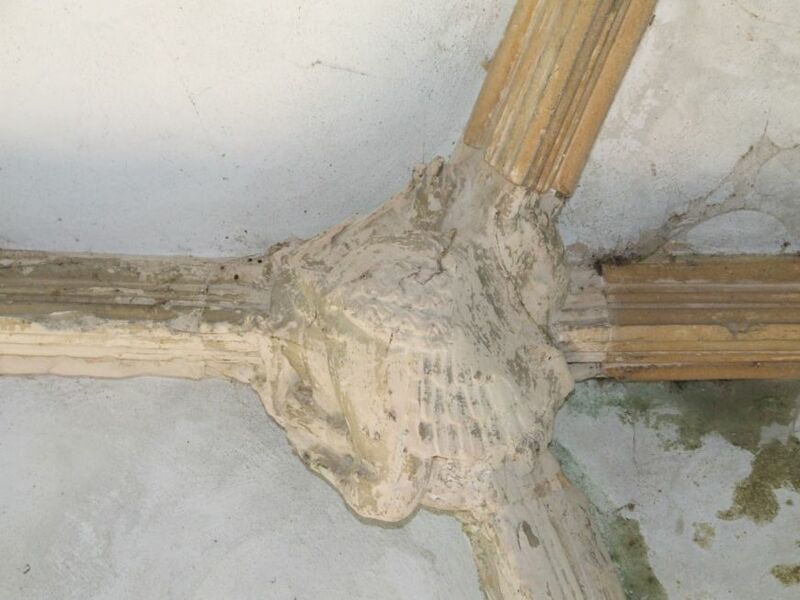 Some of it is English medieval, and was probably bought from builders who carried out Victorian restorations. Most of it is later and continental, the fortunes of foreign revolutions ensuring its survival in the hands of English collectors or otherwise. Some of it dates from the 1880s fitting. But it is a beautiful collision of circumstances, intriguing to explore. 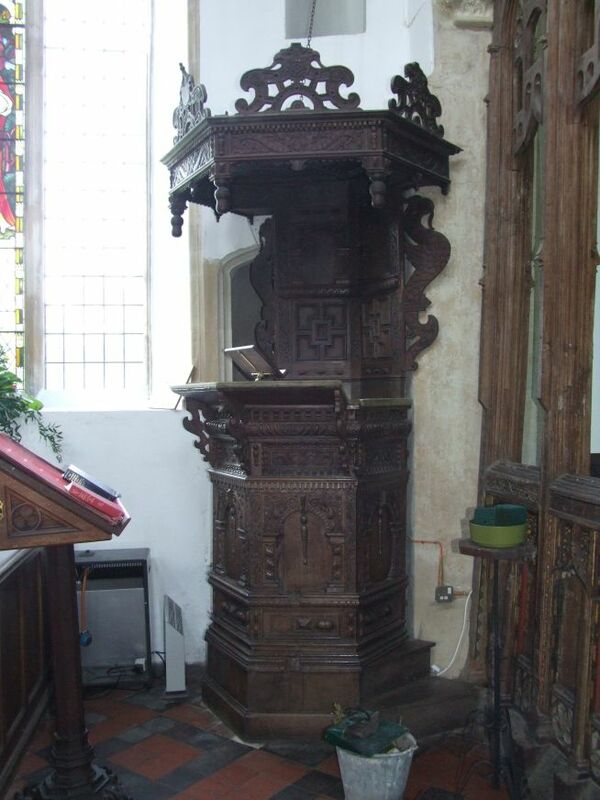 St Mary has what is probably the best Jacobean pulpit in Suffolk, a glorious, towering, crowned object, which must have put the puritans' noses seriously out of joint. Nearby is a reminder of more recent days; Holman Hunt's painting The Light of the World is a popular text for late 19th century stained glass, and is rendered with variable quality. But the version here at Yaxley is the best I've seen, I think, but it is made even more interesting by who it remembers. 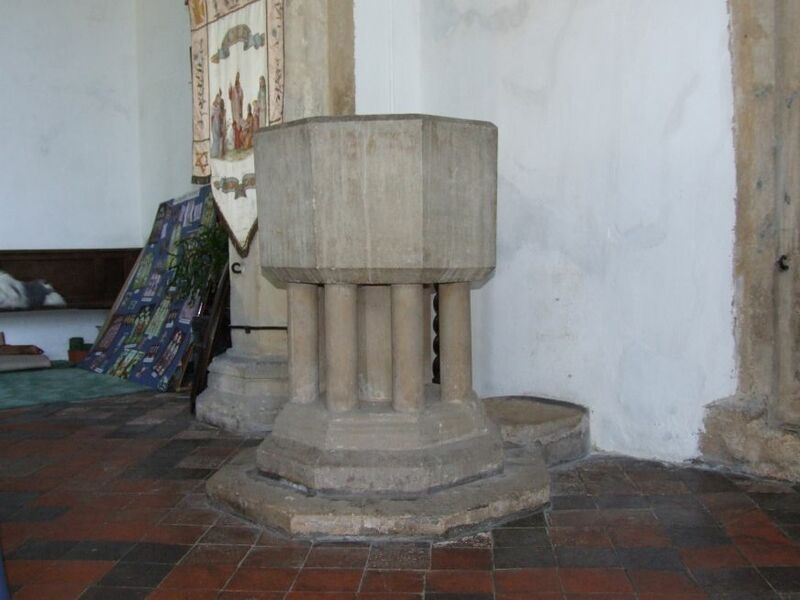 It is the memorial for William Henry Sewell, Rector here in the later decades of the 19th century. Sewell was responsible for the massive restoration here, but it has to be said that it was done quite well, probably because of Sewell's Anglo-catholic sympathies. 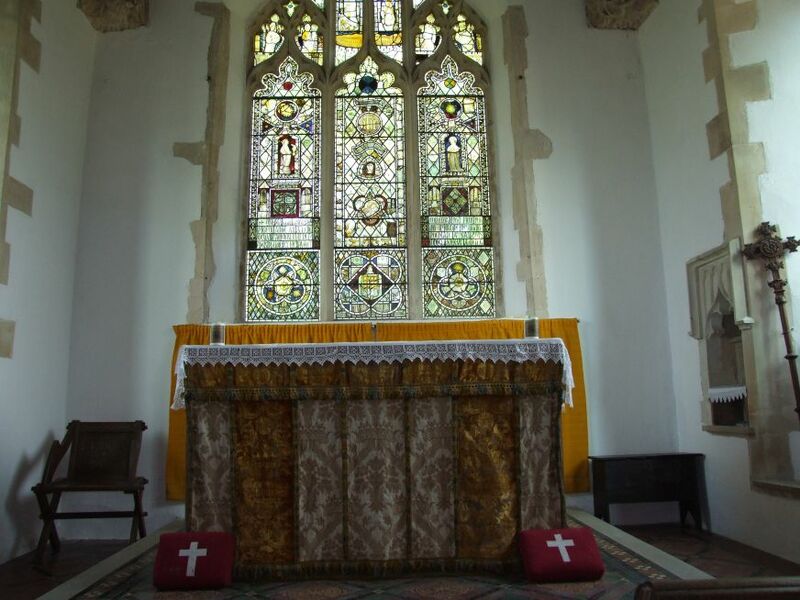 Sewell left Yaxley feeling like a proper, rural village church, and yet a sacramental space fitting for those exciting days when anything seemed possible for the Anglican communion, when for a few brief decades it really was a National Church. Echoes of those days survive, for like Eye across the road this church is still in the High Church tradition, and the chancel and aisles are neatly fitted out in a seemly manner, including a memorial to Japanese prisoners of war in the south aisle. Perhaps most poignant of all is the early 20th century silk Sunday School banner on display at the back of the church. Even more remarkable, this church has the oldest visitors book I have ever signed - the first entries date back to the 1880s, when William Henry Sewell was still Rector.